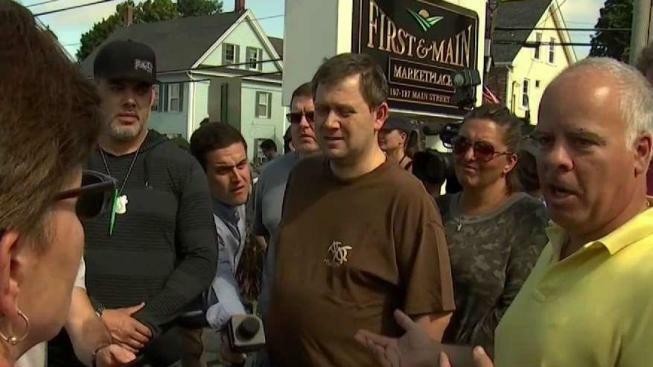 Merrimack Valley homeowners displaced by a series of fires and explosions believed to have been caused by over-pressurized natural gas lines continue to express their frustration with the gas company. Customers took to social media to blast Columbia Gas for taking nearly 5 hours to issue a statement in response to the explosions. Columbia Gas customers in Andover, North Andover and Lawrence were forced to evacuate their homes. The utility company said its crews will visit all 8,600 customers to shut off each gas meter and conduct a safety inspection. Merrimack Valley homeowners displaced by a series of fires and explosions believed to have been caused by over-pressurized natural gas lines are expressing their frustration with the gas company. They came looking for answers Friday, hoping to meet with representatives from Columbia Gas to find out when they might be able to return to their homes after being evacuated on Thursday. Instead, the gas company executives just took their names and numbers. One homeowner confronted one of the Columbia Gas workers, shortly before they drove off. "You were supposed to be here at 10. You were 50 minutes late," the resident said. "How am I going to find out? I don't know if you're going to call me. Are you going to come back?" "We don't have any answers," one Columbia Gas representative said. She then turned to a colleague and said, "I think we need to leave." She and two other gas company representatives then got in their vehicle and drove away. The Columbia Gas employees said they're going to bring the information they gathered back to their office and find someone who can answer the homeowners' questions. The gas company issued a new statement Friday in response to the disaster, saying they were saddened to learn of the death of 18-year-old Leonel Rondon of Lawrence, who was killed when a chimney toppled by an exploding house crashed into the vehicle he was in. "Our thoughts and continued support are with those who have been injured and affected," the company said in its statement. "We are focused on providing as much support as possible to our customers, residents and communities. We are grateful for the community’s patience, as well as the tremendous support we have received from our first responder and law enforcement partners." The company said its crews need to visit each of the 8,600 affected customers to shut off each gas meter and conduct a safety inspection. They said anyone who shut off their gas meter on their own should not attempt to turn it back on. "We expect this will be an extended restoration effort, and we are working tirelessly to restore service to the affected customers," the statement said. Representatives from the gas company are expected to speak later on Friday, according to state officials. Columbia said it is working with the authorities to understand the cause of the explosions. Some residents took to social media Thursday to criticize Columbia's initial response to the explosions, which came nearly five hours after the blasts. U.S. Sens. Edward Markey and Elizabeth Warren are calling for an immediate Senate hearing with representatives from the natural gas industry to understand how the explosions occurred and to make sure it never happens again. Gov. Charlie Baker said Thursday night that he thought the gas company's response was "adequate." But he also promised to "hold the appropriate parties accountable for their actions."